I am always on the look out for interesting heirloom varieties to plant in my farm garden and this season was no different. I planted the Red Seeded Citron Melon and I was very successful in growing this odd melon. 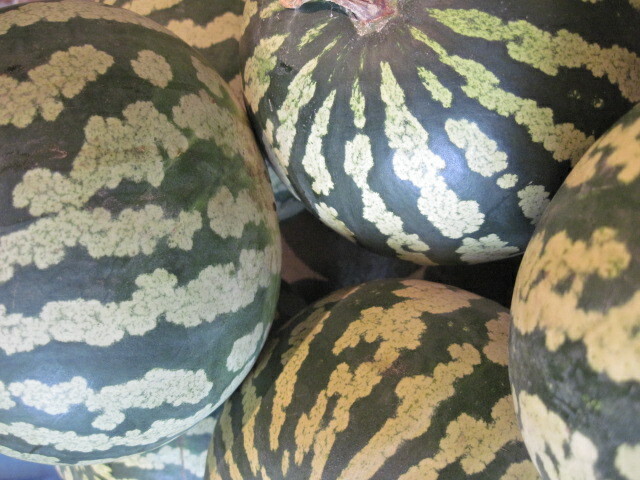 This “Citron” is a watermelon not a citrus fruit as some people are wont to believe. The Red Seeded Citron is a very old melon appearing in manuscripts in 1580. Both the status of the red seeded and the green seeded citron are endangered. These seeds are not maintained by the Canadian Gene Bank. It is hard to figure out just when Citron fell out of favour with gardeners and housewives. The last reference the Seeds of Diversity Seed Bank indicates is in 1968 although seeds can still be purchased from small producers. In 1937 McFayden Seeds from Winnipeg, Manitoba notes, “It is one fruit that every practical housewife grows in order to obtain an economical supply of preserves for use during winter.” I suspect that with the close of WWII and the new prosperity that followed might have hastened the citron’s decline. Afterall, it is a single use fruit only good for preserving. Truth to tell, I have not found an abundance of Citron recipes. The Home Cook Book compiled by Ladies of Toronto and Chief Cities and Towns in Canada in 1877 has a recipe submitted by a Mrs. Carter simply called “Citron Preserves” and a further recipe submitted by Mrs. W. Arthurs on “Preserving Citron.” An additional recipe is from a book which is a little more current dating from 1953 and entitled The Complete Book of Home Preserving by Ann Seranne. Here is but a single recipe. Both books are short on instruction. The citron rind is very hard and needs to be cut off. There are a great number of seeds and the flesh is hard so using a fork to remove the seeds is necessary. Any hint of flavour is discrete at best. Both recipes suggest slicing the flesh “in thin slices.” This was nearly impossible without the use of a food processor. Also, the recipes were vague on amounts, although Mrs. Arthurs’ recipe starts with 10 pounds of sliced citron which means she started with 20 pounds. She must have had muscles way and above my scrawny chicken wings. 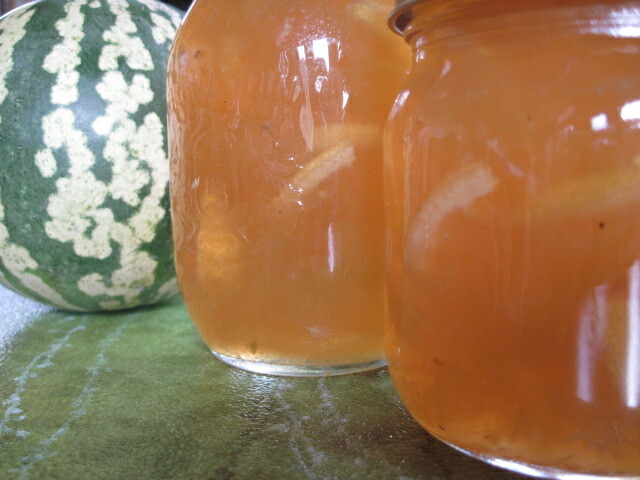 My first batch of Citron Marmalade ended up with 4 1/4 pounds of prepared flesh and I was exhausted! This is my interpretation. The marmalade needs to age for a month before using as it does not set up immediately. 1. Prepare jars and lids for preserving . Combine the sugar and water, bring to a boil and simmer for 20 minutes. 2. 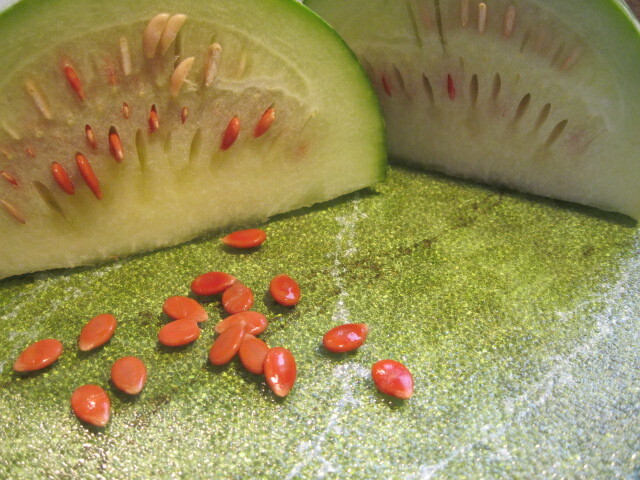 Peel and seed the melon and cut into thin slices (I suggest a food processor unless you need the exercise). 3. 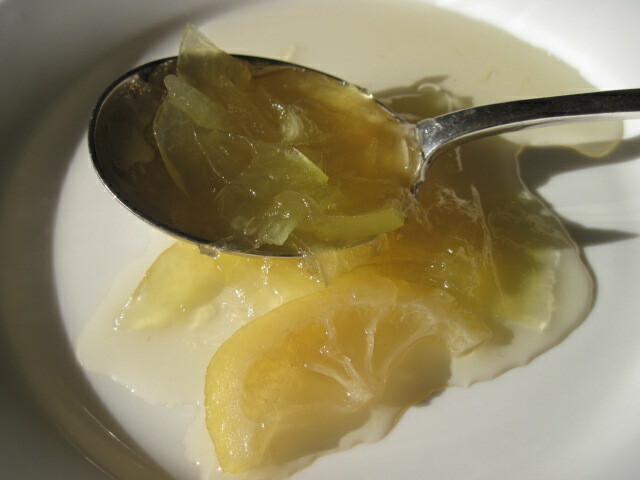 Add melons, lemons, vinegar and ginger root to the syrup and simmer until the fruit is clear and tender. This takes about 1 1/2 hours. 4. Fill jars and process. Will I make this marmalade again? It will have to be darn good. If (and it is a great big “if” ) I were to make it again, I would try a different method of preserving. Given the work involved, I think I have discovered the secret to the demise of the Red Seeded Citron. I made some quince cheese. I swear those fruit are part mineral. I dulled my knife and wore my arms out. I will remember to bring you one to try. Thank you for the gift of quince cheese. I look forward to trying it. It is popular in Spain but not so much in North America.